The best part about visiting Maine is that its lasting memories are often never on the agenda. Think a quiet spot along the coast after the tide has gone out. Or an encounter with nature - say a moose - in the wild. Or a homemade swing suspended by a branch off an ancient tree. The most northeast New England state has a draw to it so pure that visitors feel the need to make it a regular stop. At Sunday River Golf Club in Newry, about as far from civilization as can be found, the theory is no different. Want an example? How about a lone bench that is perched among the five tee boxes on hole No. 9? Made out of nothing more than a log the bench is simple, providing a resting stop for the legs. Yet it is also spectacular, providing a panoramic feast for the senses. "People sometimes walk around out there, and I put it there as a place to sit down and look at the vistas across the valley," said course superintendent Dave D'Andrea. Waiting for a slower group ahead never felt so calming. Sunday River has a way of doing that. Its motto is "Beneath the Mountain. Above the Rest," which pretty much sums up the heavenly terrain the course was laid upon. Set amongst the heavily-forested Mahoosuc Mountain Range, it is just under a two-hour, gravity-tugging drive from vibrant downtown Portland. Summit elevation is 3,140 feet at the nearly 11,000-acre resort where skiing is king, but golf hardly takes a back seat. 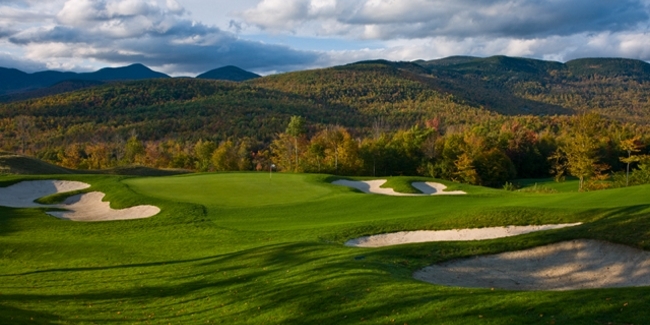 Like most golf in Maine, Sunday River is worth the winding journey. Opened in 2005, the Robert Trent Jones, Jr. design provides a snapshot at every turn in the cart path. There are dramatic downhill holes but uphill ones mixed in, too. Classic bunkering blends well with waste bunkering. 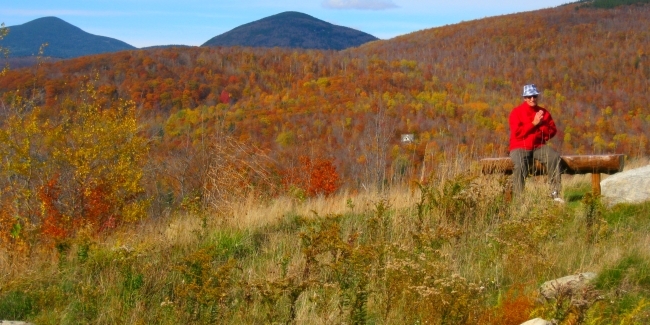 And in the fall, when the season is short, the array of colors seems to go on for miles along the mountains. 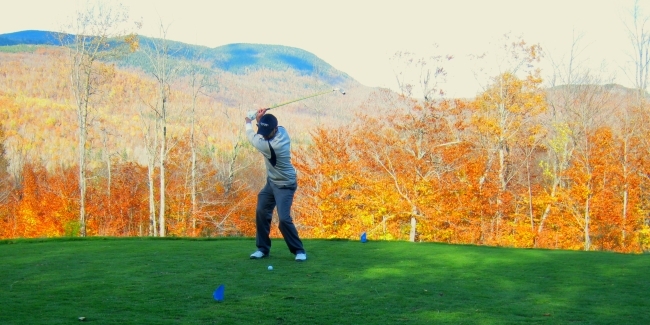 Widely regarded with Belgrade Lakes, Kebo Valley, Sugarloaf, and Carrabassett Valley as one of the top public courses in Maine, the 7,130-yard layout (from the tips) plays in an uncommon way, too. "Our fairways are quite big, quite large. Most fairways are 30-40 yards wide," said head golf professional Andrew Labrecque. "And depending on where you play, the closer up you get, the harder I think the golf course gets especially for the single digit handicap to middle handicap golfers. The further back you get, the more wide open the golf course gets. I don't think many people really notice that at all." While Sunday River has a mystical quality to it, other top 18-hole courses in Maine highlight golf architecture from another generation. Old Marsh Country Club in Wells, just off the Maine Turnpike south of Portland, and Penobscot Valley Country Club in Orono, home to the University of Maine, are two of those spots. Like Sunday River, they are properties of the Harris Golf portfolio. Old Marsh, designed by Donald Ross restoration specialist Brian Silva, features an attention-grabbing mix of styles harkening back to beginnings of golf in the United States. "It was my job to make the course a joy and challenge to play," said Silva on the inside cover of Old Marsh's yardage guide. "This was accomplished via random bunkering, kick-slopes and raised green settings that often fall off steeply into deep bunkering and with loving adaptations of the tried-and-true golf forms, angles and strategies of (C.B.) Macdonald (the father of American golf architecture) and his protégé Seth Raynor." Old Marsh (2008) is unique to New England in that it has more of a Florida feel to it. There are water hazards on 10 holes, a great mix of different length par fours, and the par fives are all reachable even from the back tees which play a modest, but challenging 6,583 yards thanks to creative green complexes. Penobscot Valley (1924) is one of 11 Ross courses in Maine. It underwent a restoration within the past decade based on Ross' original drawings. Before that, the layout had essentially been untouched but was in need of green and bunker repair among other items Harris had in mind upon acquiring it. Harris also manages several nine-hole courses with more of a mom-and-pop feel. Wilson Lake in Milton dates back to the 1930s. Freeport Country Club is just minutes from the LL Bean Flagship store. And Mere Creek in Brunswick is at the site of a former Naval Air Station. Play Where the Presidents Play! History runs deep at Cape Arundel Golf Club (established 1896) in Kennebunkport. Babe Ruth played there. So, too, did 1913 U.S. Open champion Francis Ouimet and a host of other legends who have helped shape the stories of golf. Phil Mickelson shot a course-record 60 on the par-69 Walter Travis layout in 2006 playing with member George H.W. Bush. Three other U.S. Presidents have teed it up there and the clubhouse was renamed the "41 House" in 2011 in honor of Bush being the 41st President. Cape Arundel is just 10 minutes away from the Bush compound summer home and is a must stop on any Maine golf trip.